Cyril John Rowsell was born in Yeovil Marsh in the spring of 1897, the son of miller John Rowsell (1868-1916) and Edith Kezia née Legg (1868-1946). John and Edith had four children; Albert Henry (b1891), Richard William (b1895), Cyril and Irene Gladys Bertha (b1899). Albert was born in Mudford, the other three children were all born at Yeovil Marsh. In the 1901 census the family were listed at Haselbury Flour Mill, Haselbury Plucknett, where John was the miller. By 1911 the family had moved to Elm Tree Farm, Westbury, Wiltshire, where John worked as a dairy manager. 14-year old Cyril was 'at home'. Cyril's father, John, died in 1916. It is not known when Cyril enlisted although, assuming he didn't enlist while under age, it wouldn't have been before early 1915. He is known to have first enlisted in the Royal Field Artillery, his Service Number being 148593. He was then, at some point, transferred to the 1st Battalion, Somerset Light Infantry. It is probable that the transfer took place in 1916 to make up numbers lost by the 1st Somersets during the Battles of the Somme. In 1917 the 1st Battalion, Somerset Light Infantry were at Arras, in action during the the First and Third Battles of the Scarpe, before heading north for the Third Battle of Ypres, where they fought in the Battle of Polygon Wood, the Battle of Broodseinde, the Battle of Poelcapelle and the First Battle of Passchendaele. In 1918 the 1st Battalion saw action on the Somme, then returned to Flanders fighting in the Defence of Hinges Ridge during the Battle of Hazebrouck (12 to 15 April 1918). On 12 April, the Sixth Army renewed its attack in the south, towards the important supply centre of Hazebrouck. The Germans advanced some 2–4 kilometres (1.2–2.5 mi) and captured Merville. During the Battle of Hazebrouck the British Fourth Division, which included the 1st Battalion, Somerset Light Infantry defended Hinges Ridge. It was most likely that it was during this action that Cyril Rowsell was wounded. 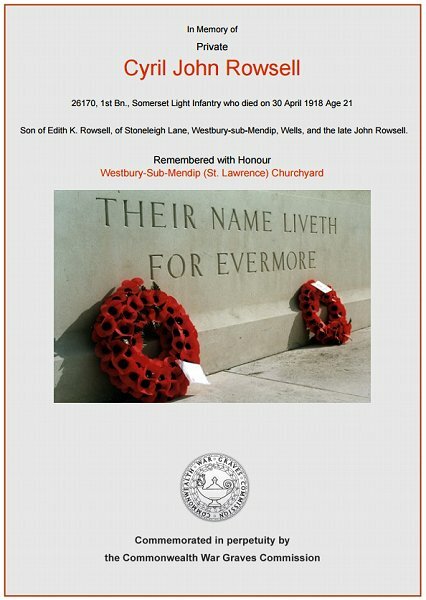 He was brought back to England but died from his wounds on 30 April 1918, he was just 21 years old. Cyril was buried in St Lawrence's churchyard, Westbury-sub-Mendip, Somerset. His name is not recorded on the War Memorial in the Borough. The Commonwealth War Graves Commission certificate in memory of Cyril Rowsell.